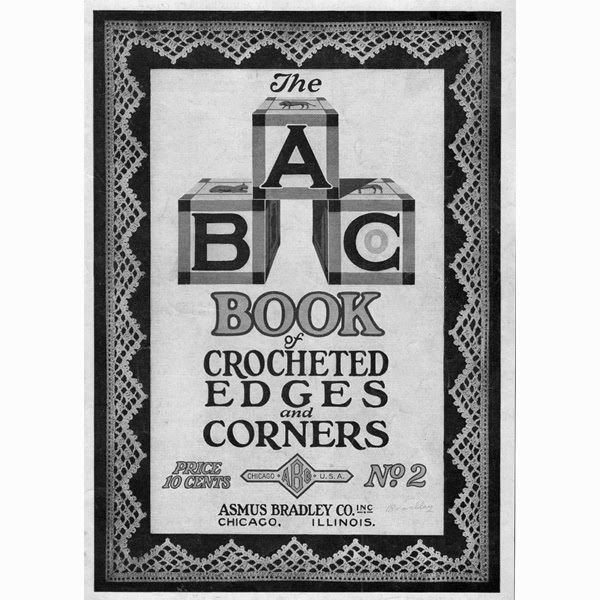 I'm slowly working my way through the The ABC Book of Crocheted Edges and Corners - No 2. This book is one of 5 that was published by the Asmus Bradley Company during the 1920's. Usually, the leaflet styled pattern books were published in promotion of a specific line of threads or yarns. And, typically, the books were from the brand name itself. You know, Spool Cotton, Botany Brands, Etc. The makers of yarns and threads, at the store level would have pattern books. 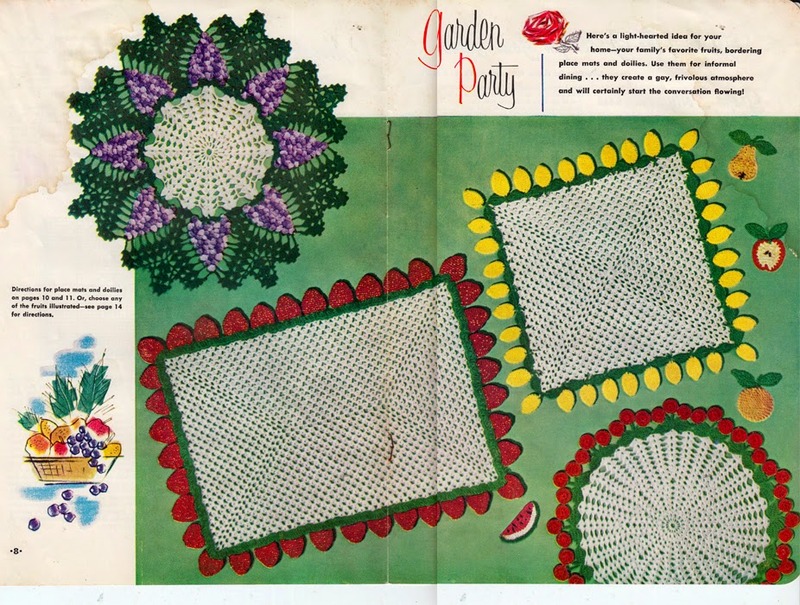 The ladies would not only buy the pattern books, but their recommended materials as well. In this line of thought, I started wondering ... Who was Asmus Bradley Co.? This led me on a two and a half hour internet search project entitled ... how I spent my Sunday morning. And, what did I learn? Well, not much. Apparently the Asmus Bradley Co. was ran by an individual named Charles E Bradley. I could find no real estate ties to them, other than renting of the fifth floor of a building at 208 W Monroe, Chicago IL. The business trade was listed as Art, Needlework Materials and Fancy Linens. They had copyright notices for their pattern books, as well as some reference to tatting shuttles. But, no manufacturing. So, my current guess is Asmus Bradley was a retailer, selling art supplies to the ladies of the times and published books as self promotion. Again, this is just a guess on my part. To try and substantiate, I've sent an Email off to D.M.C. asking them if there was any other relationship between them. (I've also asked for their recommended equivalent guide for the No 40 Six Cord Cotton). 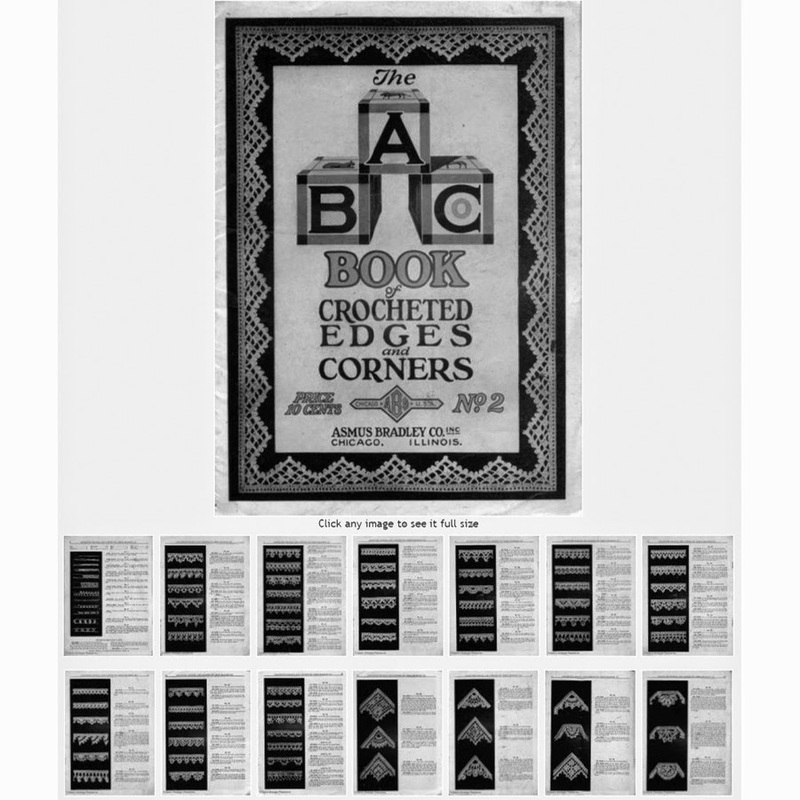 All that aside, let me get back to this book -- The ABC book of Crocheted Edges and Corners. It's a quite nice book with 18 pages; 16 of which are individual patterns for crochet edges and corners (just as you might suspect). Okay, time for me to get back on track. P.S. I'll update this post should I receive an answer from D.M.C. (Not often, but once in awhile these companies do answer). I needed something light to work on for a couple days and selected a small doily leaflet from the awaiting stack. The pattern book takes us back to 1954, post war-era, when life and economy were booming. 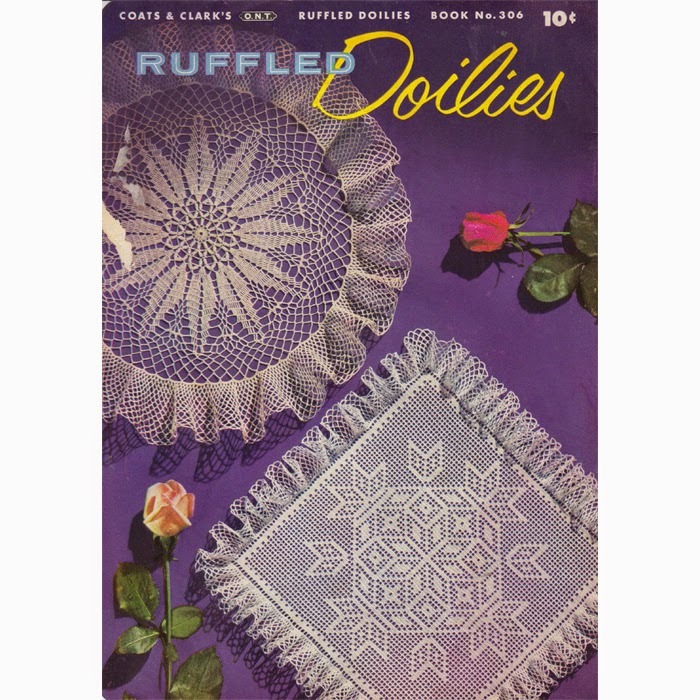 The leaflet, just 16 pages, is called Ruffled Doilies and is Coats & Clark's Book No 306. The book was issued as a marketing promotion for their Mercerized Crochet Cottons - Best Six and Big Ball. S-582 Sunburst (top) - What a unique way the designed the rays for this Sunburst. Small pineapples turn into ruffles, which lead to larger pineapple rays. 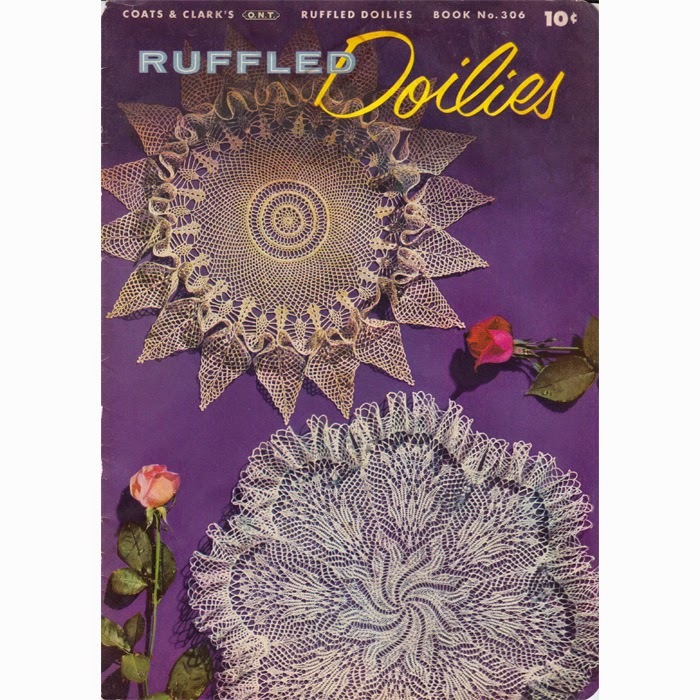 floral display and the final scalloped border of ruffles. And, on the inside cover is this bit of prose. I particularly like the 'in your hearts of lavender". S-584 Bride's Doily (Top) is a lovely 20 inch crocheted design that has a center of small flower medallions that is bordered by wide ruffles --- yes; just like a brides bouquet! S-585 Wedding Ring (Bottom) is a nice combination of crochet and hairpin lace in contrast colors. 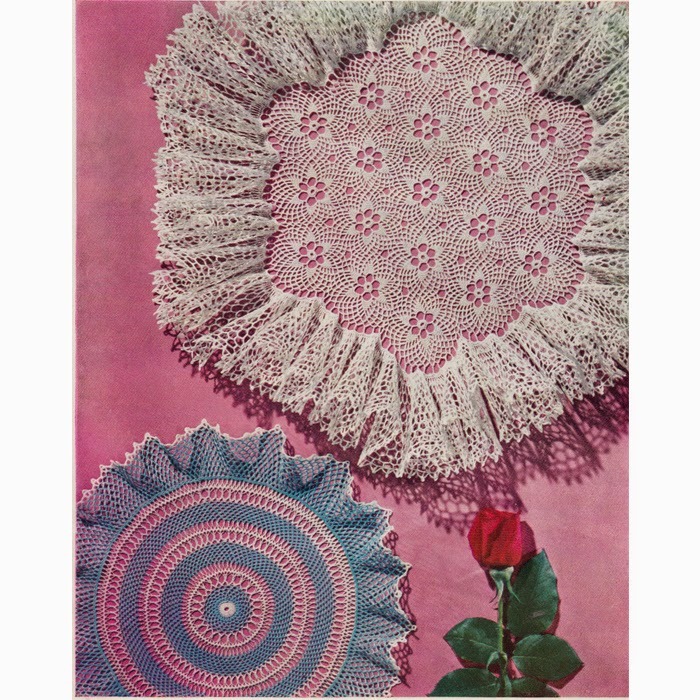 S-588 Grape Doily (upper left), is a grand and colorful piece in 5 colors. Don't let the picture fool you; this doily is 17-1/2 inches in diameter. S-589 - Fruit Mats are a trio of choices. Square, oblong or round. Strawberry, lemon or cherry. S-592 Rock Pool is an exquisite affair with a center wheel and celtic knot, all made whole with the lace ruffle. S-586 Poinsettia is a larger design at 18 inches with the marvelous Poinsettia leaves and flowers followed by mesh and a smaller ruffled border. And, there you have it ... 11 patterns, which included one that is filet crochet. 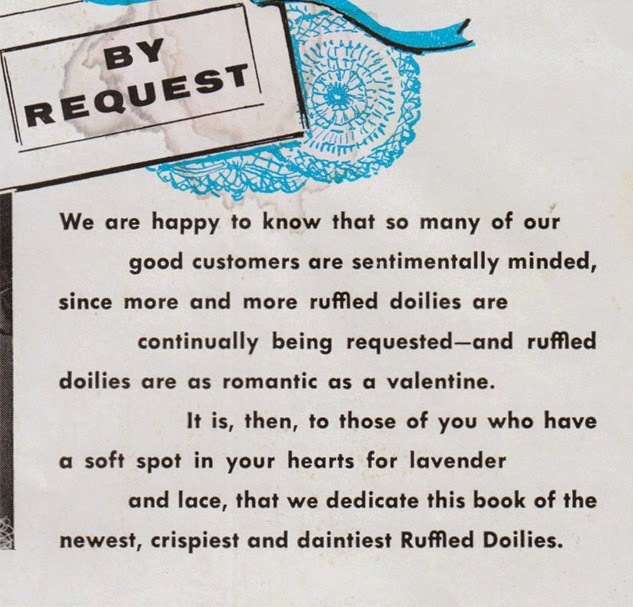 Although the book is called "Ruffled Doilies", not all of these designs are ruffled. The all do, however, have the commonality of a well defined border. Rock Pool is by far my favorite of the group. Well, this book is now finished; guess I'll have to open up the cabinet and decide what to work on next. 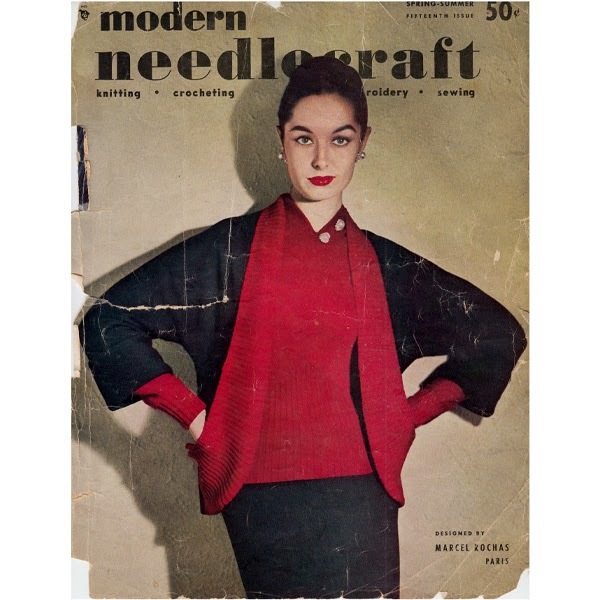 I've just finished processing Modern Needlecraft Magazine for the shop and wanted to take a couple minutes to reminisce before filing away in the 'completed' cabinet. This magazine is Volume 15 and is the Spring-Summer issue for 1952. There are 47 patterns in the magazine. I processed 33 for the shop. I don't typically decide which are sellers or not; they all deserve to be preserved. But, in the case of this magazine, there were a number that were incomplete (you know - cont. on page 89 and nothing there), as well as some that called for ordering of specific forms or parts that are no longer available. These old magazines were really an extension of advertising. The yarn/thread brands would place their advertisements, and the majority of the patterns listed were using these specific brands. Being 1952, the majority of materials are discontinued. Where possible, I've started putting in some links to cross-reference what the yarns were. As typical, the magazine is divided into categories ... the something for everyone approach. Well, almost anyway -- afghans, cloths and bedspreads were excluded. Here are a few of my favorites. Ribbed Sleeveless Knit Pullover has summer fun written all over it. Knit Two Piece Set for Baby. My copy of the magazine is quite fragile and I was pleased to work up fairly decent photos from the little clips given. There are other patterns from the magazine scattered here and there in the shop as well.